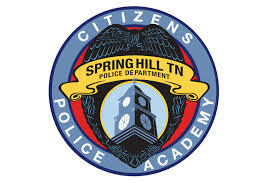 The Citizen’s Police Academy is designed to give citizens a better understanding and increased knowledge of Spring Hill Police Department. It is the mission of this department to improve communications between the citizen’s and the police. The Citizen’s Police Academy will begin June 16. This is a 12-week program that meets Thursday evenings from 6:30 to 10:00 p.m., with the exception of one Saturday, and consists of classroom and hands-on instruction. In addition, participants will be given the opportunity to ride along with officers and become familiar with a variety of police equipment.